Nest Box to be replaced after bushfire. Photo: Jo Antrobus. Leadbeater’s Possums were first discovered at Lake Mountain in 1983. In 2003, 30 Leadbeater’s Possum nestboxes were installed at Lake Mountain Plateau and due to a reduced number of natural tree hollows they were rapidly colonised. Hollows in this area are in short supply due to a limited number of mature (over 100 years old) trees, with young trees having not formed hollows yet. The last bushfire at Lake Mountain was the Black Friday Fires in 1939. Most Snow Gums, the dominant tree species at Lake Mountain take a very long time to recover from fire due to the cool climate and and snow cover restricting growth especially during the winter. The Snow Gum population recovers from fire by regenerating from seeds along with the damaged trees slowly resprouting. There is both epicormic and lignotuber growth, particularly from the base of the trees. Prior to February 2009, 28 of these 30 boxes had Leadbeater’s nests built in them and as many as 19 had Leadbeater’s Possum colonies denning on their last day of inspection. The population of LbP’s was estimated to be between 100 – 300 individuals. Unfortunately on Black Saturday, February 7th 2009 Lake Mountain Plateau was burnt at high fire intensity and 95% of the area and LbP habitat was burnt. Despite the high intensity fire experience 6 animals managed to survive in 3 locations across the plateau. 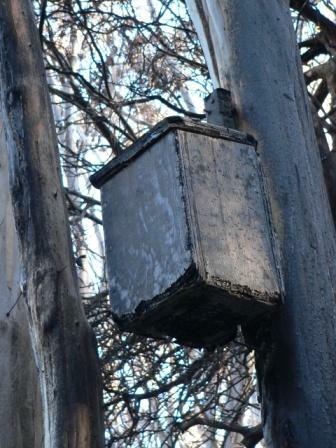 Parks Victoria managed a rapid response to this critical situation replacing burnt nestboxes to provide surviving animals shelter as soon as possible. Overnight video surveillance and a supplementary feeding program were also implemented during the harsher winter months from May to October during 2009. The rationed measures of nectar were to assist surviving LbP individuals while there was a limited food supply available in the slowly recovering alpine habitat. Leadbeater’s Possum at Supplementary Feeder. Photo: Parks Victoria. Video evidence from December 2011 showed a significant loss of animals from the two surviving colonies at Lake Mountain. After extensive surveys to try and locate the missing animals a decision was taken by the Leadbeater’s Possum Recovery Team and DSE to rescue the remaining three animals (one adult female and two unrelated young males) and bring them into Healesville Sanctuary. 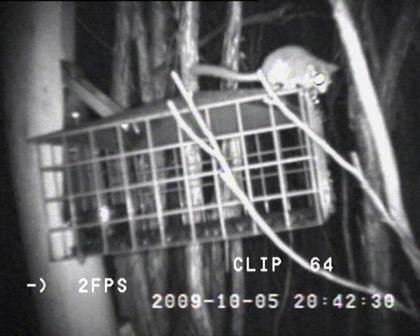 On the day of their capture, video evidence showed a large feral cat on top of their feeding station at Lake Mountain, indicating predation could have been a factor in the disappearance of the other animals. Two of the rescued animals are currently doing well, however one animal was found dead in 2012 in its enclosure from unknown causes. DSE has now determined that the remaining two animals will remain in captivity for the rest of their lives rather than be released back to Lake Mountain. There hasn’t been sufficient vegetation recovery to support their release and feral predators are still active in the area.